Cooking a steak is one of the simplest most primordial things a human can do — but it is still a mystery to many. 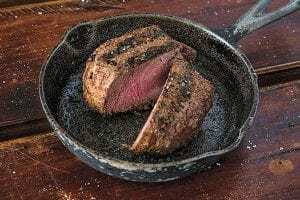 From Uncle Bob’s secret “4 minute and 29 seconds per side” formula to the old thumb to forefinger “doneness” test, there are lots of wrong ways to judge how a steak is cooked. We strongly recommend that instead of putting a lot of money into a fancy grill or oven, put a little extra money into a good digital meat thermometer and get very familiar with a CONSISTENT cooking method and the internal temperature to which you prefer your steak prepared. What is internal temperature and how does it work? The USDA recommends that all beef be cooked to 145F or more. But that’s WAY beyond where most folks we interact with want their steak cooked. Here are some different levels of “doneness” defined in simple terms. These are established on a HOT grill, not a warm grill. We generally grill or cook at 400 – 450F. If you are cooking at a lower temperature, pull the steak when it’s closer to the actual temperature you’re trying to achieve. Its internal temp will not “coast up” as much it would at a higher temp. Blue – This is when a steak is quickly seared on both sides. The inside of the steak will remain uncooked. This is the most “rare” that a steak can be ordered at most restaurants, and not all restaurants will oblige the request. Internal temperature will be from 100 to 110F. The texture of a “Blue” steak is different, and for most fans of “Blue steak,” it is an acquired taste. It is executed best with a properly aged steak. For those who like Blue steak, there is no substitute. Rare – Red center from edge to edge. The middle 75% of the steak should be very red. Finished internal temperature of meat is recommended to be 120 – 130F. We cook HOT, and what we have found is that pulling the steak at an internal temperature of around 110 – 115F will generally “coast up” (latent heat will migrate to the center of the steak) to around 120F. If you leave it on a hot grill until the thermometer says 120 – 125F, you’ll end up with a “Medium Rare” steak, unless you’re using a cooler grill or oven. Medium – The “experts” call internal steak temp of 140 – 145F “Medium.” Around here, a medium steak will usually result in groans. We’ve done it purposefully on occasion, and to achieve Medium doneness, you’ll want to pull the steak at approx 135F and allow at least 5 minutes to rest so the internal temperature can equalize. Medium Well and Well Done – You’re on your own. We cook burgers from 145 – 150F, but that’s about it unless we’re cooking a brisket or other low & slow cut.